What is a domain without a website? Sure, it can still be a valuable asset, but until developed and live, it’s like an unhatched egg. It’s got endless potential but that potential is not yet realized. That said, I’ve see some great domain name that have terrible websites on them. That’s not full potential by any means. Web design, like domaining, is an industry in and of itself and has many facets. It’s a close cousin to domaining in that they are each important to one another. You may recall a review back in August regarding a book, Domain 360, by Peter Prestipino. Peter is also Editor-in-Chief of Website Magazine. Peter and I recently discussed Website Magazine, his book, and the domain industry. Mike: Who is Website Magazine designed for? Who is your target audience? Peter: Website Magazine is published for those with an interest in using the Internet as an opportunity to accelerate the success of their enterprise – that includes e-commerce merchants, information publishers and service providers. The target reader is one who typically has several years of experience in digital design, Internet marketing or some other related digital field including user experience optimization or analytics, and is looking to learn more about a similar or complementary area of interest. An example of that might be a Web designer who is exploring extending their services to include search engine optimization, or an affiliate marketer looking to improve engagement rates (and ultimately monetization) through user experience or loyalty initiatives. Mike: Have you been around since the birth of the business? Tell us about the early challenges of launching and sustaining a publication like this. Peter: I am indeed the founding editor-in-chief so I was actually there before the birth of the magazine – when it was only a twinkle in our publisher’s eye. The early challenges were not unlike growing any business – pressure to keep cost low, increasing demand for revenue, customer awareness hurdles and, of course, fundamental objections to the business model itself. It was not uncommon during the initial startup years, for example, to hear questions about why there should be a print magazine about Web business – it was perceived as moving away from the paperless ideal of the Web. The thing is, people really enjoyed (and still do) taking the time to step away from their screens and get more involved with content and a print magazine most certainly filled the void. Mike: How have the website and Internet marketing industries evolved over the years since you started your career? Peter: In a word, dramatically. There are as many differences as there are similarities, of course, but there is no question that the Internet marketing industry of today would be nearly unrecognizable to those that began the practice so many years ago. It’s certainly more crowded (competition) and every layer in the technology stack is more robust and powerful, but I am still a big believer that brands which focus on providing genuine value, support and solutions to their users/customers will be those that stand the test of time and achieve the most success. Mike: You’ve written a book on domain names. What is your take on the newer TLDs that are offered today? What does it mean for businesses and search engine results? Peter: I believe there are advantages and disadvantages to using the new TLDs but on the whole I think they’re a positive addition to the namespace; we’re really only on the cusp of a savvier and more sophisticated use of these more compelling options. For businesses, the nTLDs provide some creative options for branding and awareness – and is a great way to differentiate offerings. I’ve not seen any formal evidence that correlates exact match domains to higher rankings, but again, there are other benefits of their use and I think it certainly is worth it in general to invest in their acquisition. Mike: What inspired you to write the book? 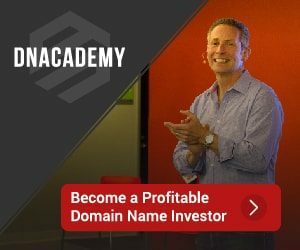 Peter: I’ve long been passionate about domain names, as I’ve both bought and sold these virtual assets and websites on many of the marketplaces recommended in the book for some time – over 15 years actually. There’s long been an air of mystery around the practice of domaining and use of domain names in general and I wanted to help clear up some of that confusion and demystify the process – both for myself and for our readers. Mike: How do you see the domain industry shifting or developing in the future? Peter: I, and others at Website Magazine, expect some significant and dramatic developments in the next few years. I believe, for example, that the industry will see more partnerships formed to add greater value to the namespace for brands and individual users alike– top-level domains, for example, might begin offering solutions directly to consumers for establishing and optimizing a digital presence. Geographic-themed top-level domains for example, might begin promoting solutions to their local area while topic-themed nTLDs arrange a stack of software designed specifically for those in that market. Mike: This isn’t your first book, can we expect additional books from you in the future? Peter: That’s right, “Domains 360: Fundamentals of Buying & Selling Domain Names” is my third book. My first was Web 360 (which covered essential topics for operating a Web business) and my second was Affiliate 360, as I’ve long been involved in the performance marketing space as well. I am working on another in our 360 series and while I can’t provide too much in the way of details, I can say that it is focused on helping enterprises, large and small, drive more website traffic and how that change has evolved in the 20 years I’ve been in the digital space.